Yesterday afternoon, as part of Jim Mora's week-daily Afternoons programme, Radio New Zealand took a look at the most recent books of two of the bigger names in the crime and thriller writing canon; Michael Connelly's NINE DRAGONS and Linwood Barclay's NEVER LOOK AWAY. It's great to see Radio New Zealand continuing its good record of regularly reviewing some crime and thriller fiction, along with other types of books. Today the reviewer was fellow blogger Graham "Bookman" Beattie, who is (deservedly) highly-regarded in the New Zealand book industry. He is the former head of Penguin Books, a Book Awards judge, a Books Editor, and is now an acclaimed blogger and consultant to the industry. Beattie said both books, although quite different, we of the "I couldn't put it down" category. 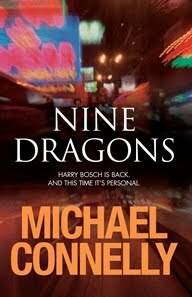 You can listen to the Bookman's full reviews of NINE DRAGONS and NEVER LOOK AWAY here (it's a file of a whole lot of entertainment commentary - so you'll need to fast-forward to 7:25mins), or you can read the text of the radio review on his fantastic blog here. His blog is well-worth visiting on a regular basis.